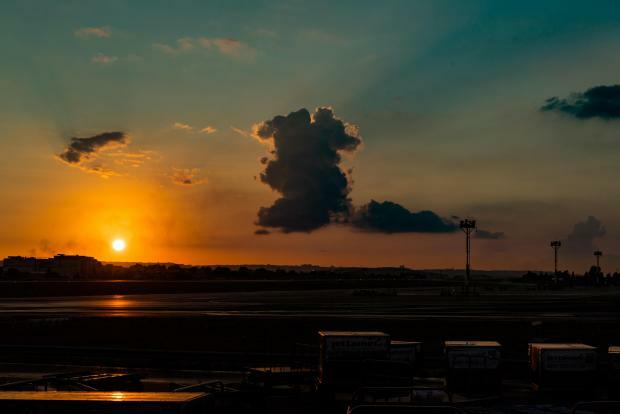 The last month of 2018 was one of sunny skies and relatively warm temperatures, the Malta International Airport meteorological office has noted. Weather records show that the sun shone over Malta for 211.7 hours during the last month of 2018, 40 hours more than the norm. December also saw air temperatures drop from a maximum of 19.4°C, on the 4th and 5th of the month, to a minimum of 5.7°C on the 28th; this being the lowest temperature recorded in 2018. Despite the sharp drop in temperatures, the weather conditions throughout the month remained mild, with an average wind speed of 10.1 knots and only 30.2mm of rainfall, 79% of which was measured on December 1. While the year ended on an exceptionally bright note, 2018 had fewer hours of sunshine than 2017, but still enjoyed an average of 236.2 hours of sunny skies per month between January and December, amounting to around 65% of all daytime hours during the year. July was the brightest and the driest month of the year, with 362.6 hours of sunshine and only 0.4mm of dew recorded, whereas the dullest month was February, recording just over 136 hours of sunshine and an average cloud cover of 4.8 oktas. Throughout 2018, the Maltese islands received 599mm of rainfall, making the year significantly wetter than the previous two, when 432mm and 324mm of rainfall were measured respectively. Following a relatively dry start to the year, 181.4mm of rain came pouring down in February, 117mm of which were measured on the 9th, making it the second wettest day in February since 1923. October not only saw 189mm of rainfall, but also recorded 16 days of thunder, making it the wettest month of the year and the stormiest month ever to be recorded. With an average of 77% humidity, October was also the most humid month last year. The least humid day of the year followed the hottest one for 2018, July 13, when temperatures reached a sizzling 35.7°C.